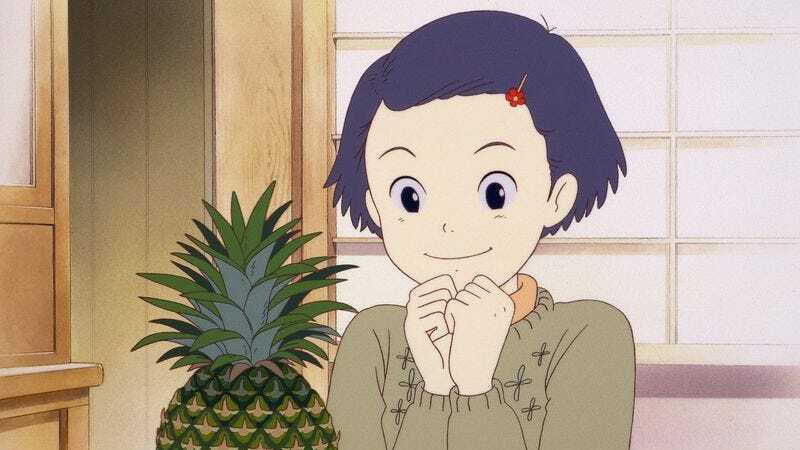 To get what makes Isao Takahata’s 1991 classic Only Yesterday so special, look at the pineapple scene. Based on an autobiographical manga series by author Hotaru Okamoto (with art by Yuuko Tone), the movie follows a 27-year-old Tokyo woman named Taeko, who takes a vacation in the country in 1982. Throughout the trip, she thinks back to 1966, when she was a fifth grader. In one of those memories, her family buys its first-ever fresh pineapple, and saves it for Sunday dinner, so that it’ll be more special. But the fruit isn’t as soft or sweet as the canned kind, so everyone heaves a disappointed sigh and gives their slices to Taeko, who gamely keeps eating, determined to enjoy something she’d been looking forward to all week. Only Yesterday is animated, but rarely cartoony, in either its design or its storytelling. Most of the movie consists of moments as memorable and as elliptical as the one with the pineapple. Taeko remembers the awkwardness of pre-teen crushes, and the fiercely fought student council debates over lunchroom rules, and that time that she flunked a fractions test and overheard her mother say that she’s “not a normal kid.” These vignettes aren’t meant to be funny, per se. They’re supposed to be real—or at least as real as any drawings can be. For the last 25 years, Only Yesterday has been the great lost Studio Ghibli film, at least as far as American audiences were concerned. Though the movie was a massive hit in Japan, it’s just this year arriving stateside via GKids, who’ve prepared a new English dub—with The Force Awakens’ Daisy Ridley as the adult Taeko and Dev Patel as a man she falls for on her retreat. Until now, Ghibli fans who wanted to see Only Yesterday have had to rely on imports, bootlegs, big-city retrospectives, and the one time Turner Classic Movies aired the film during a salute to the studio. Walt Disney has released other offbeat Ghiblis over the past couple of decades—including Takahata’s Pom Poko and My Neighbors The Yamadas—but this is one of the few that it left on the shelf. It’s not hard to understand why. There’s never been much precedent for a movie like Only Yesterday in American multiplexes or video stores (back when there were video stores). Half of the film offers the pleasantly meandering tale of a young woman looking for some purpose in her life—a story geared more toward adults, in other words, but in an animated form that many mature American moviegoers still find inherently juvenile. The other half consists of the kind of anecdotal childhood memories common to young-adult novels, although the incidents Taeko recalls—like the one time she made her father angry enough to slap her—aren’t all exactly “fun.” A good long stretch of Only Yesterday is devoted to fifth-grade girls learning about menstruation, and how they live in perpetual fear that the boys will think they’re having their periods. Disney probably had no idea what to do with that. But it’s that betwixt-and-between quality that’s made Only Yesterday a favorite among the American Ghibli fans who’ve found a way to see it. The film has often been compared to the work of Yasujiro Ozu, in that so much of it is about the at-times-stifling domestic politics of one middle-class Tokyo family. And the deliberate pace—quietly, keenly observational—is definitely Ozu-esque. But the unflinching depiction of pre-adolescence as a time of anxiety, mood swings, and deep embarrassment is akin to a Judy Blume novel. And the 1982 scenes are reminiscent of old Hollywood romances like Now, Voyager or Summertime, where a woman takes a trip and figures out who she wants to be. The more modern-day sections were Takahata’s additions to the source material. Only Yesterday was the follow-up to his critically acclaimed WWII film Grave Of The Fireflies, which was also based on a memoir about childhood. But Takahata had a harder time connecting to Okamoto’s memories of The Beatles and miniskirts, so he imagined Taeko’s adult life, introducing a subplot where her she meets a man, Toshio, who talks at length about the history and future of Japanese agriculture—impressing her with his connection to the simpler way of living that she envies. Visually, Takahata distinguishes Only Yesterday’s two eras by having his animators illustrate the 1960s with spare backgrounds, pale colors, and plain faces, while the 1980s pop with fine, vivid detail. That experimentation with style and design—sometimes subtle, sometimes jarring—was common practice for Takahata, all the way up to his most recent film, The Tale Of The Princess Kaguya. Here, the simpler approach to the past makes each element stand out more, replicating the way memories are often selective. In Japanese, the movie’s title roughly translates as “memories come tumbling down,” but Only Yesterday works better, because of its double meaning. Taeko is haunted by her younger self, because so much that happened back then is still fresh in her mind, like a wound that won’t heal. But the story is also about her realizing that she can let go of that past—with all of its attendant guilt, anger, shame, and expectation—because “yesterday” is ultimately inconsequential. 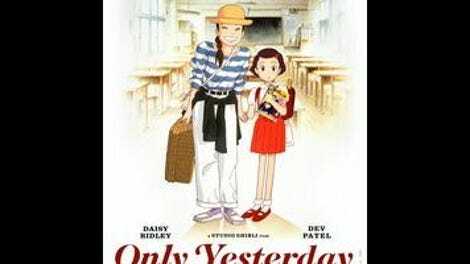 Only Yesterday can sometimes seem a little too random in what it chooses to show, but it has a cumulative power as Taeko comes to understand that the past that shaped her needn’t define her. That’s a remarkably sophisticated theme for any film, let alone a cartoon. But then what else should we expect from a filmmaker so precise that he’d spend five minutes describing the exact texture and taste of a piece of fruit?